Vegetable Glycerin (VG) or vegetable glycerol is a carbohydrate usually obtained from plant oils. 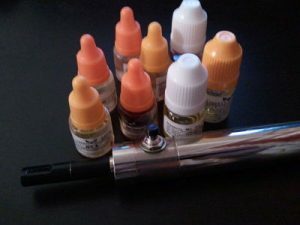 In the e-cigarette industry, VG is used as a base for e-liquid, but it has a variety of other uses, like ingredient for various cosmetic products and sweetener for food products. Unlike propylene glycol, which has no taste, vegetable glycerin has a certain sweetness to it, which sometimes affects the flavor of the e-liquid. It’s also slightly more viscous, which many vapers believe shortens the lifespan of e-cigarette atomizers, although the reduction does not seem to be that dramatic. The increase thickness of VG also has an upside – it produces considerably thicker vapor compared to PG-based e-liquids. To get the best of both worlds, many e-liquid producers mix both propylene glycol and vegetable glycerin in their juices, with the most preferred ratio being 80% PG/20% VG. Both vegetable glycerin and propylene glycol are classified as “generally recognized as safe” by the FDA, and is considered one of the most benign organic substances known to man. It is hype-allergenic, non-carcinigeic, non teratogenic and non-mutagenic. 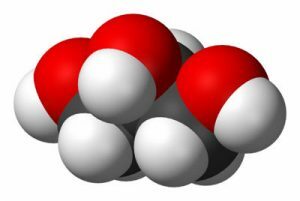 Compared to propylene glycol, VG very rarely causes allergic reactions. the only people which may experience problems with the metabolization of vegetable glycerin are diabetics. Within the first few weeks of switching to electronic cigarettes, the inhalation of vegetable glycerin may cause a series of side-effects, like dry mouth, increased thirst or throat soreness. These symptoms usually subside after a few weeks, especially when plenty of water and other liquids are consumed. I caught my 15 year old son using one of the E.Cigs and he was using VEG Oil. HE said he did his research and it will not hurt him but instead it relaxes him when he is feel tense. Now understand he has ADHP. I am not sure what to believe. His mother and myself have never smoked in our lives. I am very confused about this. Please share you thoughts and concerns. In response to Mike above. I used to smoke but have switched to vaping and have seen the relaxation that your son described. I dont vape with nicotine. I dont see the need for it as the vape it self does relax me in a more focusing way unlike when I smoked cigarettes I would get a small buzz kind of like a weed buzz or alcohol buzz but none the less is a lot less harmful then weed or alcohol.